Texas Rangers prospect Will Lamb was as a standout two-way player in college. After twirling his second strong start for Hickory, he knows he made the right decision to concentrate on pitching. Lamb allowed one hit and two walks while striking out six batters over five scoreless innings in the Class A Crawdads' 3-1 win over rehabbing Stephen Strasburg and the Hagerstown Suns on Monday. "Strasburg pitched a great game and he's a great player, but we played well tonight and did everything we needed to do to win," said Lamb, a weekend starting pitcher, outfielder, first baseman and designated hitter at Clemson University. "I would have liked to see what I could do against him with the bat, but I love pitching. There was a lot of buzz coming in to the game and it was exciting." Making his second South Atlantic League appearance, the left-hander faced the minimum the first time through the order, and he did not allow a hit until Jason Martinson's double to left field to lead off the fifth inning. No Suns batter made it to third against Lamb. "It was a 2-1 changeup," Lamb said of Martinson's hit. "I thought he was sitting on my fastball, but he waited on it and got his hands out to it. So I tip my hat. "My fastball and changeup worked well and I got my slider over when I needed to, so it worked out well. I started off fastball, fastball and when they started taking big hacks, I would go change-up, fastball, fastball and mix in my secondary pitches." Hagerstown only got a runner into scoring position against the 20-year-old one more time. In the fourth, Lamb walked Michael Taylor and David Freitas, but he got Kevin Keyes to pop up to end the threat. "It was good. It was a mind-set thing," said Lamb. "I don't like giving free passes, but I gave up two. I just had to attack, attack, attack. When you don't, that is when they get to you." Lamb, selected in the second round of June's Draft, has held batters to a .096 (3-for-31) average since his promotion from Class A Short-Season Spokane on Aug. 14. In his Crawdads' debut Wednesday, he yielded two hits and three walks while fanning four over 4 2/3 innings in a 3-2 victory over the Charleston RiverDogs, but he says pitching at a higher level is anything but easy. "Back in the Northwest League, it was more about throwing it up there and seeing if they could hit it. It was all fastball, it wasn't about using your secondary pitches," Lamb said. "Here, you have to have a game plan every time out and you have to set up hitters." On Monday evening, he did that better than Hagerstown starter Strasburg, who threw 40 of his 60 pitches for strikes in his fourth rehab outing of the year. "I wouldn't say that I was facing Stephen Strasburg. I was facing their lineup," Lamb explained. "I wasn't focusing on him, but it was a little different. It's always a benchmark to see what you can do. "I watched what he did and looked for things that I could pick up on. I'm competing against a high-quality player, so I wanted to see what happened. Tonight, the juices were running a little more." In 12 games -- including seven starts -- for Spokane prior to his promotion, Lamb was 1-1 with a 3.89 ERA and 42 strikeouts over 37 innings. The biggest challenge has came from focusing solely on his work on the mound. 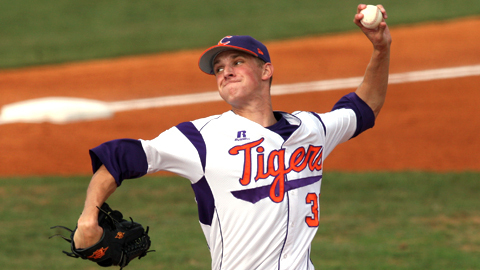 As a junior at Clemson this year, Lamb went 1-1 with a 5.11 ERA in 10 games on the mound. He also hit .358 -- the fourth-best in the ACC -- with 11 doubles, a team-high four triples, three homers and 39 RBIs in 59 games. He predominantly played center field. "It's been fun, but it's been an adjustment," he added. "I've not been on a full-time pitching program before, so the bullpens, the long toss, the running and the weights are all new. I've learned a lot and I'm grateful that the Rangers have put their trust in me." Strasburg (0-1) took the loss for the Suns. The first overall pick in the 2009 Draft, Strasburg allowed two runs -- one earned -- on a pair of hits and and a walk while striking out six over three innings.